No plot? No problem – Growing your own in a small space. 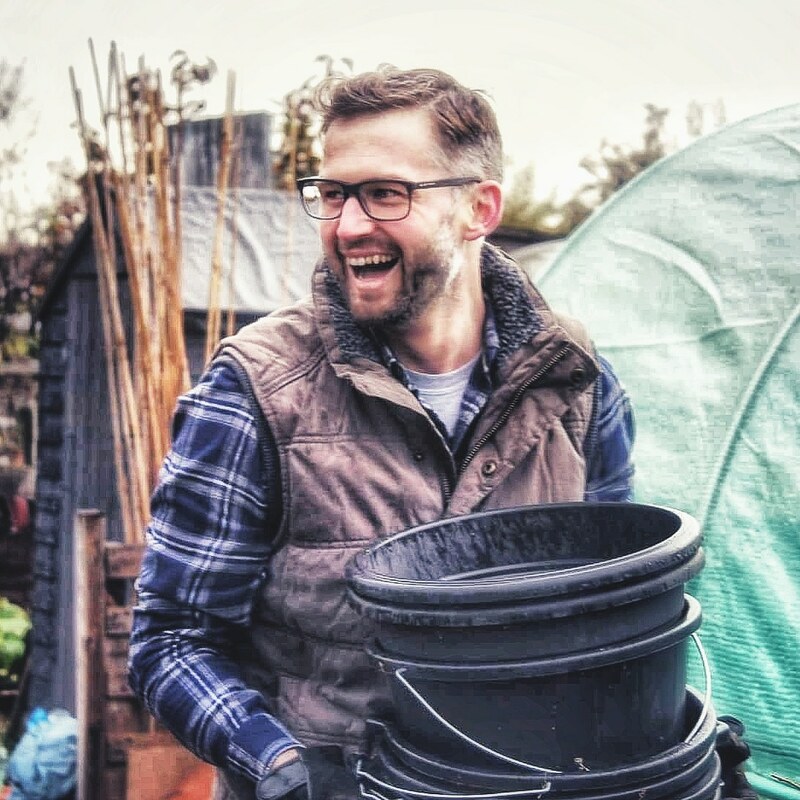 Richard: I would love if everyone took on an allotment garden and I’ll continue trying to inspire others to do just this. However, if it’s not possible to get yourself an allotment (perhaps you’re on a long waiting list) or the thought of a large plot is daunting, the good news is you don’t need one to enjoy all the pleasures and benefits of growing your own fruit and veg. In the video below, Katherine Crouch (BBC Gardener of the Decade, 2008) demonstrates the possibilities of growing vegetables in a one-metre square patio planter. (Video, Siliverline ToolsTV, You Tube). Raised beds are a fantastic investment when space is tight. The benefits include better soil quality, better drainage and soil that warms up faster for early spring sowing. If this sounds appealing, you might consider WoodBlocX – They offer award winning raised beds with a clever design and they look stylish too. Just take a look at the transformation the WoodBlocX team made on Sean’s Allotment. My passion for growing my own began with a packet of tomato seeds, a pot and small back yard. I’m glad to have my allotment, but you can grow fruit and veg terrifically at home – in your own back garden. Steve: For years I watched in admiration as people on Facebook posted pictures of amazing veg they’d grown in immaculate plots. I had my first experience of growing my own veg when I moved into my own home in 2010. The house had a small garden measuring 20ft long by 13ft wide. It was full of rubbish and overgrown with brambles and tall grass. I remember looking over the fence at my neighbour’s garden and seeing it full of flowers and vegetables. I’d long craved for a cottage style garden, but felt I had not space or the experience to do so. When our first child arrived, I was determined to make use of the outside space we had. Originally, I thought to simply flatten and clear the area and make it a safe and practical place to play as a family. It stayed this way for the first year. My grandad’s had an allotment for years and so I was familiar with growing fruit and vegetables in an allotment garden, but I’d never thought to use my own garden for growing my own as it didn’t seem plausible. One summer I got into a conversation with my next door neighbour and realised he was doing just that. We talked for hours over the hedge line that night, discussing various plants he was growing and how he integrated them into his small garden. From that day I was hooked. The first vegetable I grew was sprouting broccoli. I had a small patch of grass which I removed at the back of the shed and threw the seeds in. The months passed with more conversations with the neighbour and the more we talked the more I learned. A year later I had a good, basic knowledge which I used to grow a few crops. I spent many summer nights, chatting with my neighbour over the fence line, but now we spoke about how much we could grow and how good they looked. The casual talks about gardening we used to have were now turning into motivation and friendly competition to outgrow the person with whom I shared the passion. In 2012, we moved to our current home and I put my name on the local allotment waiting list. I joined a Facebook group and started daydreaming about what I could do with my own space. I got to work on the home garden and built a raised bed to grow our own veg at home. You could say it was my first official plot. I wasn’t a huge plot, just 2.4m x 2.4m. The one thing I loved was my daughter was old enough to join in. For 2 years I grew veg in this space and learned a valuable lesson – The art of growing in a small space. In June 2015 I received my first quarter plot at the allotment site. I had the privilege of being able to choose my plot and there was only one I wanted – the one next to my grandad. For years I’d wanted to grow with my grandad and now here I was with my own plot right next to his. Over the next season, I grew as much as I could and tried a lot of things. The first year was like a honeymoon period. I had some failures, some learning curves but best of all a lot of fun. I listened to everyone around me, I shadowed my grandad on everything he did and got a lot of information from the internet. For my first year, I did really well. In my second season, my confidence grew. Over the winter I discovered the No-Dig method from Charles Dowding and was intrigued. For years I was taught that to have a successful plot you had to lay the muck, till it in and have the best soil possible. Here was a guy telling me I didn’t need to do this and his results proved it. My plan for the second season was to do just this – No-Dig gardening. All winter I prepared my paths using wood to map it out and lay down the muck on the beds. I still remember the looks I got from the old timers and the lengthy lectures I had about the need to ‘aerate’ the soil. It was amazing. Needless to say, I plotted on and the season was the best I ever had. The crops were amazing. One of my best achievements though was my cabbage. Totally unexpected it grew to be a monster and one of the biggest that had been grown on the allotment site. After that, everyone wanted to know how I did it. It’s fair to say I converted a few old folk after that! However, after a great season and a wonderful community, I still felt that something was missing. Having dreamed of having my own plot for years, here I was not enjoying it as much as I thought I would. I decided to go back to where it had all started – Growing at home, right in the heart of my family. Over the past few months, I have gone through the process of building my perfect box-bed and I’m happy to say it’s been a successful journey. It’s only 3.6m x 3m and I know it’s enough to provide plenty of veg for my family. The best bit – my daughter is enjoying being a part of it. After documenting all my progress on twitter from the allotment, I discovered another love- writing about it on Plot44 Organics. I passionately believe that anyone can do what I’m doing. I consider myself in a minority of people who still grow at home like they used to. By continuing to document my journey as it stands today, I hope that it will show that you can grow healthy organic vegetables, in a space small enough to fit in your garden. Do you grow your own vegetables in small space? I’d love to hear about your experience and any advice and tips you might have. Let me know in the comments below. Previous Why move to ‘no-dig’ allotment gardening? Next Why make compost? It’s the heart of the allotment garden.